Manual Screen up to 2M. 10M Cables & connection plate. Fixed price no hidden charges. As part of AV Installs commitment to providing quality audio visual products and installation services that offer true value for money we have put together some exciting deals! We have carefully selected a range of products that we have grouped together with our own professional installation service to offer our customers an excellent return on investment. This bundle includes everything you need for a professional audio visual presentation in a small to medium sized room with an audience up to 75 people. 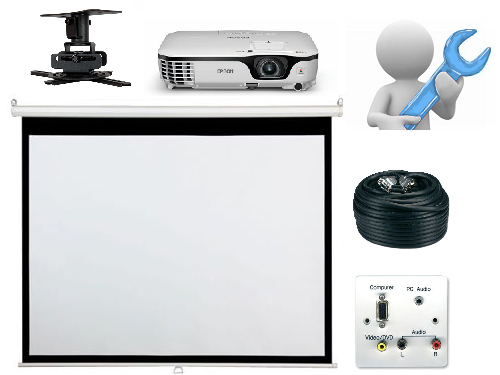 No more struggling to set up the equipment up, with AV Installs professional Installation service the projector will be ceiling mounted and a wall mounted input plate will be provided, this makes connecting to the projector extremley easy with no need to set up each time. We also include all the interconnecting leads required to get you connected along with a full demonstration at the end. Multi-layered construction with fiber glass backing helps screen remains taut and prevents any V-waves from forming.